Los Angeles is experiencing an ongoing drought, but you wouldn't know it by the looks of the lush Edens I saw this weekend at the "Mar Vista Green Garden" tour. 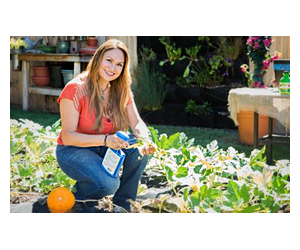 Living and gardening in Los Angeles is a year-round pleasure for those of us with a taste for decadent, verdant gardens and the ability to create them on a "small water budget." Over 44 gardens were open to the public, all incorporating such green vanguards as lawn-replacing ground covers, low water plants, edible gardens, drip irrigation, rain barrels, recycled materials, green roofs and much more. The public was encouraged to walk or bike the 5.5 mile tour loop, but I drove because I'm not a local. Those who self-propelled themselves through the tour were well rewarded with gorgeous, low water, organic and very green gardens. Silver, creeping Dymondia, carpets the crevices of the flagstone walkway while pink Oneothera spills into the foreground. The garden is designed by Sarah Herman and also features feathery Nasella, "Mexican feather grass," red and yellow Anigozanthus, "Kangaroo Paws," Carex comans, Cercis and more. The parkway is planted with easy care Dymondia and toffee colored Libertia peregrinans that looks like it's breaking through the ground. The Nasella grass dances to the chorus "umber waves of grain!" An edible artichoke takes center stage in this front yard garden. It takes a few years to be rewarded with edible fruit after planting an artichoke, once a strong root system is developed. This "lawn-less" front yard boasts succulents, wildflowers, grasses and a dry river bed to soak up the water when it rains. This garden has "zero-tolerance" for water runoff! Green hardscaping was also on display. This decomposed granite and pea gravel stepping stone entry walkway was designed by Paula Henson and made to absorb rain water instead of sending it to the public sewer system. The driveway is also a pervious floor created with gravel and granite tile blocks. This rain barrel is strategically placed in the corner of the yard where rainwater falls from the roof. The red Cercis Redbud tree adds a lot of color to this water-wise garden. Other plants include Pelargoniums, Aeoniums, Salvia chaipensis and Euphorbia x "Martini"
I'll post some more photos of this idea-filled tour later this week! You now have the choice between leaving a conventional comment or a video or photo comment. We hope you’ll join us again this year! The tour will be on April 25th from 2 to 6. There are 79 drought resistant and edible gardens this year and 6 different walking tour maps posted on the site! I hope you blog on your tour and make sure you drop me a line to check out your photos! I’ve been to many tours and I have to admit, I meet both friendly and “snotty” people. Yesterday at one of the gardens, my husband commented to me how “snobby” one of the designers was and I had to agree. The guests were all super nice, many of them biking as a family! Wonderful photos – they really help show how lovely and lush a low water garden can be. In my neck of the woods we our annual Bringing Back the Natives tour next Sunday featuring, you guessed it, gardens that are all or mostly natives. Have you noticed how much friendlier plant focused tours tend to be vs. those highlighting high end hardscape? Thanks for your visit. I’m posting more photos this week, so come back and see me at EdenMakers! Thanks for the inspiring photos. Always looking for examples of drought tolerant combinations! How nice of you to drop in and track your “muddy shoes” in with a comment! You were doing the greater work yesterday . The tour was really fun and I met lots of other designers who I knew about but never met personally. I missed David King yesterday. My husband and I did one of the suggested tours and it was getting late so we didn’t have a chance to go to VH.